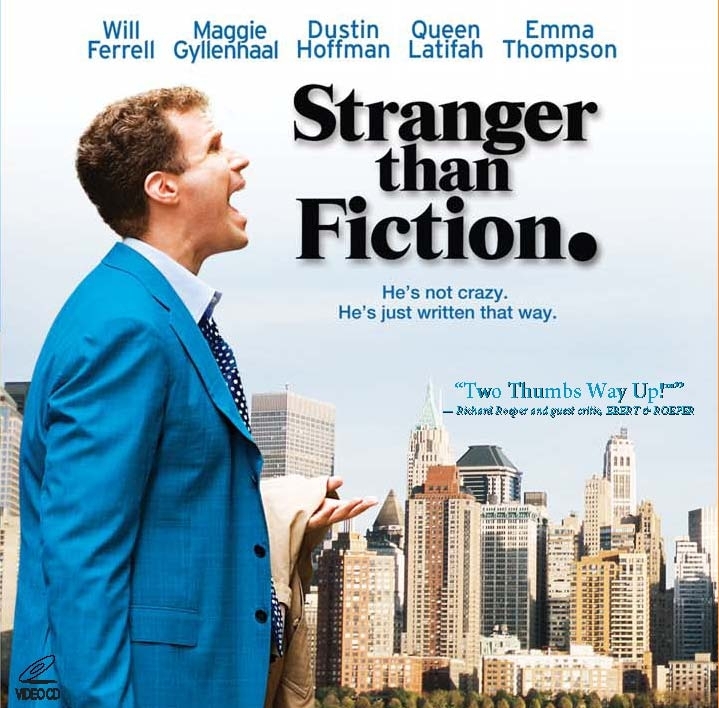 Stranger Than Fiction is one of the craziest, zaniest, and quirky movies ever made. It’s a charlie kaufman movie without charlie kaufman. the movie is about a guy who hears a voice narrating his life. it’s got that out of the box, completely original identity. kaufman’s movies have always been strange, whether it’s being john malkovich, about finding a tunnel that leads into malkovich’s brain, or adaptation, about two twin authors who end up writing themselves into the story they’re trying to tell. but Stranger Than Fiction is different. it might have the same kind of crazy idea, but it’s about a real simple and kind person, who finds himself living out a wonderful romance. the narrator dictating harold crick’s (will ferrell’s life so that only he can hear it is just the beginning. it’s funny in a truman show sort of way, with him brushing his teeth and thinking that maybe the tooth brush is speaking to him (remember truman standing in front of the mirror, and how the mirror was a giant camera recording all of it? ), but then it goes much further into the darkness of what is to come. for one thing, the narrator says pretty early on that “little did he know,” harold crick was soon going to die. hearing this sets harold off. he starts freaking out even more so than he was doing before. Now he has a mission and it’s got some immediacy to it. it isn’t just find out what this is all about because you’re curious, it’s find out what it’s all about fast, before it’s too late. that’s when we meet the author who is writing the book and start spending time with her. this is where the movie becomes reminiscent of adaptation, not only spending time with the character who is the subject of the book, but also with the author. Stranger Than Fiction works because it is not only creative, but also very funny. will ferrell plays a sort of straight man here, very serious and very much to the point, and as a result, he’s funnier than ever. sometimes when a comedian plays it straight, the funny just comes out of them naturally, and that’s really the best kind. look at adam sandler in punch drunk love. here, it’s not ferrell who is ridiculous (like what is usually the case in his movies), it is everything else that is happening around him. first the voice, than the woman who thinks she can just choose not to pay her taxes (the charming baker, anna pascal, played by maggie gylenhal), and then there’s the professor who asks howard the most bizarre questions without ever losing his straight face. that professor is played by dustin hoffman, and he’s the next stop on crick’s list after a visit to therapist linda hunt. hoffman’s character, professor hilbert, isn’t a shrink or a detective, but he acts like both. howard hires him because he is a professor in literature, both classic and contemporary, and boy does that knowledge helps fuel this story. hilbert makes it his first goal in helping howard to find out what kind of story howard is in. Is it romance, comedy, tragedy? the irony is, it’s actually a bit of each of these. at the start of the movie, howard is a very boring tax accountant. he doesn’t think about his dreams or fantasize about life, but instead counts brushstrokes and footsteps and things like that. the movie has a lot of fun with that, employing a new sort of technology that shows us in white images that pop up onto the screen, exactly what howard is thinking. this could have easily been silly, like thought bubbles, but the movie uses the perfect font and perfect robotic look to make it all seem more mechanical than cartoony. and it works. we get inside harold’s head (being john malkovich?) and we see the world exactly as he sees it. and boy is it boring. that’s why hearing this voice becomes so special for him. especially hearing that he’s going to die. now, suddenly, he decides to live life as he never lived it before. that doesn’t mean bungee jumping and sky diving, it means letting go. it means not following the auditor – auditee protocals that would normally prevent him from asking anna out, but instead, just going for it. the scene where he brings her flowers is fun, but it’s nothing compared to when he sits down to play her a song on the guitar. this movie is not only well-written, and well-filmed (the getting inside his head, imagery), but it is also cast perfectly. ferrell is absolutely dynamite as the lead character. his straight man performance is the best acting job of his career. the same can be said of maggie gylenhal. she has never been cuter or sweeter, and at the same time, she doesn’t do it by being a little fragile whiny girl the way liv tyler used to, but instead, by being a very liberal, very outgoing and tough feminist. aside from those two, dustin hoffman is also magnificent, delivering lines with the most perfect timing and stone cold straight face. after these initial three, the movie is still cast well with emma thompson and queen latifah, but it is those three who really make the movie into something special. Stranger Than Fiction is an absolute powerhouse of a movie. it’s got the out of the box, completely fresh and original ideas. it’s got the romance, humor, and tragic elements. and it’s got a remarkable cast of actors who are just perfect for their parts. all of it, of course, starts with the story, and that is what truly drives the movies every step of the way. this is about a man who changes who he is and learns to enjoy life, and it’s all because of hearing a voice. the great part is, he isn’t crazy, and the voice isn’t his conscience. it really is an author who is writing his story and his eventual death at the same time that howard is living it. the fact that he goes and finds this author and bridges his story together with hers just shows how smart and willing to take risks this movie really is.